Ok, so last Friday, as I'm sat reworking my 5 year financial profile... by month... I have to be honest- I was questioning my direction in life. I came to the conclusion some time ago that I work so my husband can be a great parent to our children, it's a compromise and it's the best for the family... But 5 year financial forecasts, I don't want to wish my life away! And the things that keep me going... the odd afternoon off to spend with my little people and, of course, our holidays. We reached the conclusion... hmmm, about two years ago, you know, around the time the sonographer said "It's twins", that it would be a long time before we holiday abroad again. With three little people the thought of a flight, or a really long car journey doesn't float my boat... neither does a ferry for that matter. 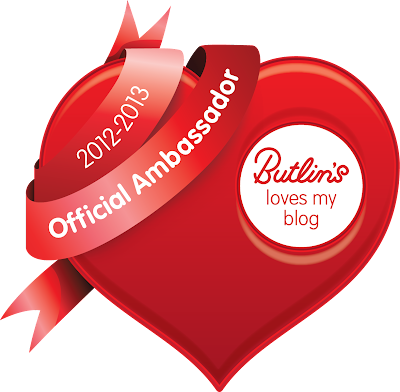 So, when I had the chance to become a part of the Butlin's Ambassador programme I had to apply. Family holidays in the UK will be a part of what keeps us sane and this seemed like an opportunity to see if Butlins will become a regular feature on our holidaying schedule. Could it cope with the whirlwind that is the Johnson Babies?! Added to which, I'm pretty sure if I stand in the garden and squint across the Bristol Channel I can see Minehead- there's a bond! So, last Friday, first there was the news that Butlins had received such tremendous interest in its programme that it had increased the number of Ambassadors from 20 to 40... and then the tweets came in. And I have to admit the disappointment arrived- it wasn't my turn. And this was the best bit, my twitter handle is not as obvious as it should be and as luck would have it my amazing Welsh Contingent spotted this and all was resolved. So now, for the next year, you will see this badge on my blog! Whatever we decide, I think we're going to have lots of fun getting to know Butlins! Disclosure: This post has been written as part of the Butlins Ambassador Programme. Thank you :) Hopefully I'll get to meet everyone soon!